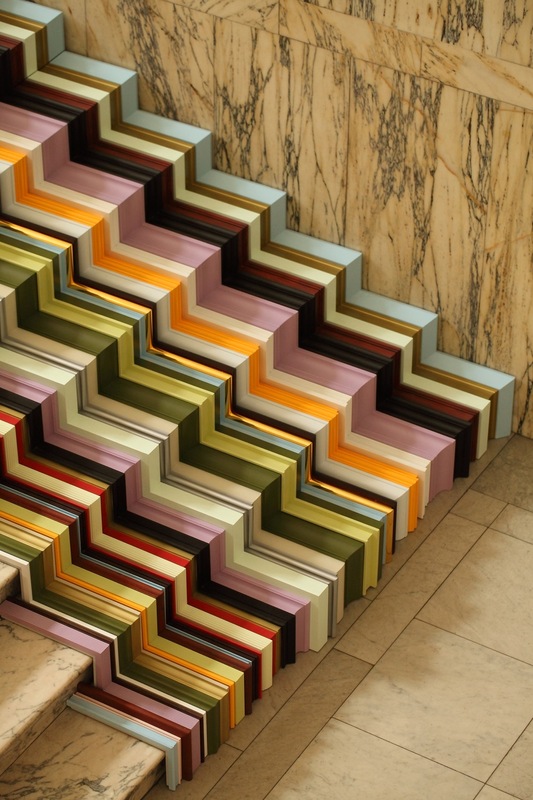 The remit for this Design Festival 2010 commission was to create an installation utilising material originating from John Jones, the renowned art framers. Hence my starting point and raw material for this piece are bespoke picture frame mouldings of different sizes, profiles, material and colours. Exploring the V&A for suitable and available locations for the installation I decided upon an elegant marble staircase. The work aligns the structural architecture of staircases with the ‘right angle’ sample mouldings commonly displayed throughout the picture framing industry. The analogy of those two shapes gave me the idea of cladding the staircase in the multitudes of mouldings available in order to create a work akin to 3D graffiti on a traditional staircase. Reminiscent of the yellow brick road in ‘The Wizard of Oz‘ a marble pathway clear of frames enables the viewer to walk through the installation. Material – Picture frame mouldings, plywood.